There are in Britain traditional and famous gardens, some of which go back to the Tudor period. These are spread across the country. Many British people like to visit these gardens to relish the cultural delights that spring from the vision of the garden's creators and which have been preserved faithfully over three hundred or more years. But we are now concerned that climate change may undermine these gardens, and lawns in particular might suffer. But all gardens must adapt with time. No garden stands still, so even small scale gardeners such as me will have to think how we respond to changing climate. Image above from Pixabay, creative commons. It shows a garden for hot, dry conditions. The world is growing warmer, ice caps are melting and weather patterns changing, and this alteration in in climate is influencing the way in which we farm and garden. Put simply, the warmer zones are moving northwards. This means that areas which once might have been unsuitable for certain types of crops now become suitable, but at the other end some areas are becoming too hot for the crops that have traditionally been grown there. This seems to be the case in parts of Europe, as the Mediterranean countries, already hot in summer, are becoming intolerably hot and dry at times. Furthermore, the conditions can be variable, for sometimes these climates can be tolerable, but then can come a heat wave that takes temperatures soaring to over a hundred degrees for a sustained period of time.Not only do crops suffer, but gardeners too can wilt under the ferocity of a heatwave, leaving jobs undone. With excessive heat comes drought, which challenges farmers and gardeners, who need to find water for their crops, but along with drought there comes the danger of fire. In some areas, such as California, we see whole swathes of land destroyed by fire, but even in Britain, where such bush fires are not a phenomenon, we can have moorland fires, when dry peat starts to burn and inflames the dry heather. These have never threatened a town, but they can take a significant time to quell, as the fire continues underground, leaving the fire fighters longing for rain. But weather patterns also change with the climate. Britain is a rainy place and we have had rarely had serious droughts, and on the whole we have had few extreme weather events. The British climate contains a measure of unpredictability, it always has, But in recent years gardeners and farmers have been at a loss to know what weather is coming in Spring and summer, as it has been so unpredictable. Springtime seems to have been drier recently. Two years ago it was very chilly, but last year not so bad. But what is happening is that some predictions seem to be coming true. Britain is divided by an imaginary line, the Tees-Exe line. To trace this take a map and find the mouth of the river Exe in the South West. Find the mouth of the Tees in North East England and draw a slightly curved line that just touches the southern tip of the Pennine range, and this is the Tees-Exe line. North West of it is mainly highland Britain, though there are some large lowland areas, such as where I live; but South East is lowland Britain, with just some small hills. North and West of the line we have been predicted to have stormier winters, but South and East drier summers, even to drought conditions at times. This is already happening. Gardeners need to take into account the type of changes that are affecting their area. If you are gardening in warm, dry conditions, ensure that your moisture supplies are preserved. This means husbanding water in winter for summer use. It is vital to retain water that falls as precipitation and use it, especially as there are sometimes hosepipe bans when water supplies run short. Many gardeners have their own water butts, some of which are fed by rainwater from the guttering of the greenhouse or shed. This water can augment the mains supply. But it is important to retain the water that falls on the ground. Keeping the ground covered with a mulch is a good idea. Take an example, a straw mulch will keep the ground cooler than it would be when it is exposed to the direct sun, and evaporation will be minimized. In really hot conditions it is better to use water effectively by not simply spraying it around, but applying directly to the base of the plant, so that it reaches the roots. When watering my greenhouse I ensure that the tomato leaves are not wet, but that the compost in their pots receives the water. Outside I direct the water to the plants' roots, so that none is wasted, and the idea of spraying water around in a sprinkler is not to my liking. Pots are a particular watering problem, as containers of all kinds dry out more quickly than the ground does. Hence container plants can easily become parched and die. If you have containers you have to ensure regular watering, and if you have to be away you need to get someone to water for you or set up an irrigation system. This can be a trickle hose that allows water to flow slowly out, or you can use a reservoir and a wick. The technique is to stand a container of water higher than your pots and place a length of fabric in it. The fabric hangs into the pot, and water is drawn by capillary action to the wick and then by gravity flows down into the plant pot. This process, known as wicking, is useful, though you need to ensure that the container is kept replenished. There are also water retention globules that you can mix into your soil, which during the year store water and then slowly release in hot times. 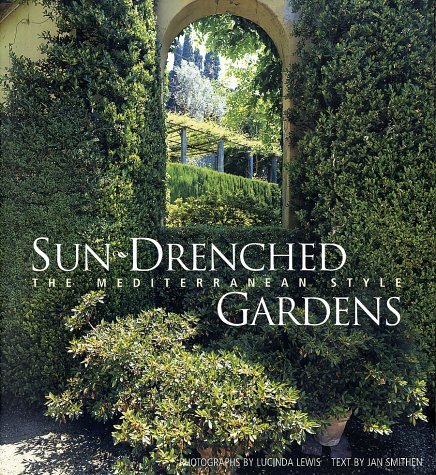 The Mediterranean garden was designed for dry summers and not very moist winters. You note that it contains no lawn. The garden is a courtyard with a paved surface. 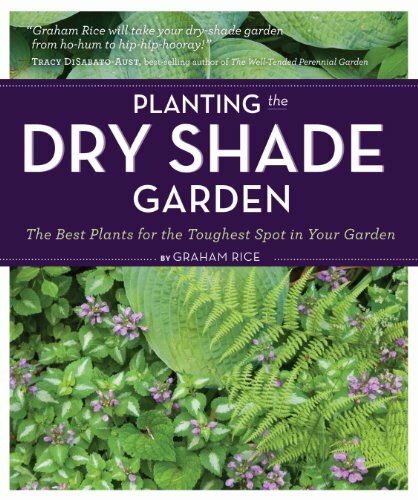 This can become quite hot in midday and so it is useful for the garden to have areas of shade. Shade can be provided by trees and plants trailing over trellises. Often these trailing plants might be vines or Mediterranean fruits, such as peaches and apricots, and garden users will be able to sit beneath the shade of trees and verandas to enjoy the garden. But moisture is preserved by careful and thorough mulching. The trees must be rooted in soil with some space around the base of the trunk for them to receive water, but the wider space around them will be paved or mulched with stones. Larger cobbles will be preferable as gravel will be washed away when watering and will look untidy, but cobbles are more easily arranged Moisture is preserved in flower beds by ensuring that the ground is well covered in a dense plant layer that shields the soil from the sun's rays. 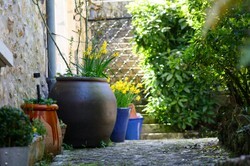 There is an emphasis on plants grown in containers, some of which are terracotta pots and others might be stone. There is a problem with terracotta, that while it looks pleasant it is porous and so water can evaporate it through it. These containers might hold shrubs or flowering plants. Plants will be selected from those that tolerate dry conditions. Agapanthus, the African lily, evolved in the dry Drakensberg mountains of South Africa; Kniphofia, the red hot poker, tolerates dry conditions and provides intense colour. Also heat tolerant is Erigeron, the Mexican daisy; and Euphorbia one of the spurge family copes well. Lavandula [lavender] is a favourite that will also attract bees. Some grasses can function as architectural plants. While pampas grass is a bit large for many gardens, Stipa tenuissima, Mexican feather grass, is a strong addition to the garden. Palm trees can be a feature, as can pygmy cypress, Cupressus pygmaea,a native of Mexico. 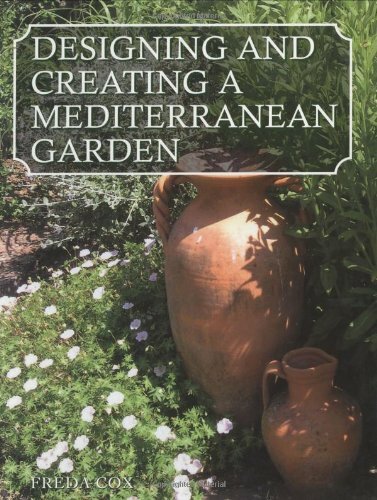 These are but a few of the range of plants for Mediterranean gardens. What future climates will be I am unsure, for I do not know whether humans will halt global warming or whether the process will accelerate, but humans will want to garden into the distant future, but they will have to adapt their cultivation practices to new conditions. Sadly, this will mean that some great lawns in southern England may have to be eliminated, as they will take up too much of the scarce water resources that we need. But gardens have to adapt over the years. There is no point in clinging to fading and unsustainable lawns, leaving them brown and shriveled. We need to be creative with what we do, taking up the past but transforming it for the future. Climate change, and possibly El Nino, are behind the storms which still beset us in northern Britain, and my area has been hit, though I personally am not a victim and the nearest floods were a mile or so from my house. Even then they were only shallow. But in parts of the country gardeners will have to deal with the problem of waterlogged soil. Some of us will have to learn to repair flooded soil. We must learn drainage techniques, if we dwell in flood prone areas. Raised beds may be essential for some gardeners in such locations. 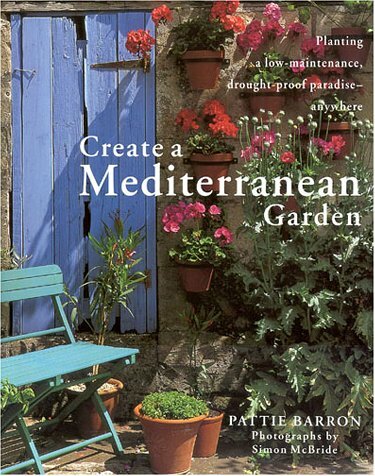 I have the Mediterranean garden with too much lawn. One member of the household is a hard hard for the green lawn. We are slowly whittling it away, though. Great informative article! I live in the US but global warming is real and I learned a lot. Thanks for this Derdriu. I was not aware of what you tell me, but the situation over here does not seem to be as serious as the situation in the USA where irrigation and fertilization are concerned. This is probably because we are a rainy island, but the golf course look does attract some people and there may be excessive fertilization. Excessive fertilization of farmland and the consequent eutrophification of rivers through fertilizer run-off is a problem here, and that is because we have much arable land. I do not know how many people practise volcano mulching. Depths of mulch vary according to the resources that the mulchers possess. But some people mulch to the trunk, when they should not. I have not heard of problems with water failing to percolate, but that may be because we are rarely short of it. Certainly, North West England, where I live, has a reputation even in Britain for rainy weather. Pests nesting in the material is a known problem. I mulch with leaves where possible, but I know that slugs can shelter in them, but my defence is that I have frogs, which regard the slugs as lunch. Frank Beswick, A problem in the USA is all the fertilizing and irrigating that businesses and residences do to get that golf course look in actuality and on film. Another problem is volcano mulching, whereby mulches are spread all the way to stems and trunks and far higher than they need be. Does that happen in the UK? Three of the consequences are proliferation of fungi, water not percolating into the soil, and pests nesting in the material. Don't be too concerned over your tomatoes. I don't know what weather you have been having in the USA, but here we have had a cold August, so the tomatoes are a bit late. Mine have been coming through for a few weeks, but there are still some green ones. Experts say that about this time of year you should take off surplus growth, that is any branch that has no fruit. You don't need to water daily now, but you can still feed the tomatoes. There are recipes that show you how to use green tomatoes, such as green tomato chutney. Oh so true, each year I miss the mark, my tomatoes have just started coming on and it is fall already. ARGH! I am going to figure this out, be more observant and tuned into Mother Nature as it occurs each seasonal change, whenever that occurs! Well said. What climate changes will bring in any area in the future is a mystery. But, we must be prepared to respond to whatever it is to be. Yet, the difficulty and losses are almost a certainty. There are no easy solutions, but we will have to adapt to the changes that are still coming. Good luck with your gardening efforts.